I had an opportunity to have a chat with Diane Walton, the managing editor of one of my favourite magazines, On Spec, a Canadian magazine of the fantastic. Diane has been with On Spec since its beginning. In addition to her editing duties, Diane Walton has published in the Northern Frights volumes, in On Spec’s own pages, and in the anthology Divine Realms. Feminist, speculative author, and fan of the fantastic, she is a fascinating character with some interesting perspectives on the Canadian fantastic. Spec Can: Could you tell readers a little bit about yourself to begin this interview? Diane Walton: Always the tough question. I’ll give you a bunch of true facts and you can pick and choose. Born in Montreal, descended from one of les filles du roi, (I have the family genealogy, courtesy of my mother). I am also told there are UEL ancestors on her side. I had dreams of being an actor, so I studied Theatre in university, but eventually went into teaching. That lasted one year, and then I joined the public service. One job led to another and then the government entered the computer age, eventually giving me some pretty marketable skills as a trainer and a technical writer and software tester. These days I do contract IT work. I read my first SF book at the age of 13. The Stars Are Ours! By Andre Norton. I quickly cleaned out the SF section of the public library. On Spec was not my first magazine. In the mid 70s I was a volunteer with Branching Out, Canada’s first feminist magazine. Spec Can: You have been with OnSpec since its beginning and are currently Managing Editor. Can you provide readers with a bit of background about OnSpec? Diane Walton: We started On Spec out of frustration, when no American magazines seemed interested in the type of spec fiction we Canadians were writing. To be fair, I’m pretty sure that has certainly changed over the years, but we still provide a pretty good entry point for Canadian writers to get noticed. It’s a labour of love, and heavily dependent on government arts funding (at this point I must give thanks to the Canada Council for the Arts and to the Alberta Culture Multi-Media Fund for their support). Spec Can: OnSpec is reaching its 25th anniversary. What were some of the things that motivated the origin of this brilliant magazine? Diane Walton: As I mentioned above– frustration was a prime motivator. Also, there was a synergy here in Edmonton. We had editorial talent and leadership with Marianne Nielsen, artistic talent with Tim Hammell, our first cover artist and Art Director, and most important, the amazing desktop publishing skills of Jena Snyder, who could turn a bunch of words and pictures into an actual magazine. We also had connections with the then-small handful of SF writers in Canada, so when we put out a call for stories, they responded. Spec Can: A lot of literary magazines in Canada tend to feature “realist” literature. What inspired the formation of a literary magazine that focuses on the fantastic? Diane Walton: We are probably guilty of some snobbery here, since we originally wanted to differentiate ourselves from the rather predictable style of SF short fiction that seemed to be prevalent in the American magazines. In other words, we weren’t afraid of publishing obscure stories with “downer” or ambiguous endings from time to time. We looked for quirky works and diverse characters that pushed the envelope a bit, and took risks. The “literary” aspect was, in part, because we had to put On Spec in a particular bucket to be able to get the funding we needed to publish, and literary was the way to get the dollars. Even now, when you look at the so-called “peer juries” for some grants we apply for, you see a lot of English Lit professors who edit poetry journals published under the banner of their particular academic institution. And those are the folks we have to convince each year that On Spec is worthy of funding. Fortunately, it wasn’t too difficult for us to actually BE literary. We wanted well-written literature and good storytelling that wasn’t too pretentious or self-indulgent. But it’s all subjective, isn’t it? We have still been accused by some grant juries of not being literary enough. You can’t please everyone. Spec Can: What are some of the ideas that have shaped OnSpec over the years? Diane Walton: What shapes the magazine is the amazing blend of people who have worked on it over the years, I think. For the most part, we do leave our egos at the door, and even when we argue over a story, we respect each editor’s opinion, and the magazine is all the better for that. So I’m not sure if this answers your question. We all just love good storytelling and the craft of writing. Spec Can: What are some of the works that you have chosen for OnSpec that have really influenced you and changed your perspective? Diane Walton: Now that is a very tough question. I can’t say that anything has managed to change my perspective, but some stories have moved me, and stick with me, even after many years. The story immediately struck me as the perfect On Spec story, and I remember having to convince the other editors at the time, that we should select it from the slush. I mean who doesn’t want a story about the end of the world? Several years ago, Jim told me that re-prints of that story have continued to make money for him. I still love to read it out loud to people. Another story I love is Robert Weston’s “Mourning Sickness”, a work of magic realism where your grief over the death of a friend or relative is visible in the form of an avatar that increases in size according to the depth of your true feelings for the deceased. Spec Can: OnSpec has done a great job in recent years of featuring stories about people who are under-represented in other Science Fiction, Fantasy, and Horror literature. What are some of the things that have inspired the editors to make sure that the magazine is more inclusive? For us, it is all about the storytelling, and the multi-faceted characters who drive the stories. Diversity is sometimes just a bonus that comes with a well-crafted story of the fantastic that doesn’t necessarily rely on the tried and true tropes of the genre. For example, when we started reading stories for the Apocalypse themed issue, we were all at a retreat together. And so we all got to see each editor’s immediate reaction to reading Camille Alexa’s “All Them Pretty Babies” , a story that examines the nature of what is beautiful. It was one of those moments when we all just knew we had a winner. Spec Can: Short stories are often viewed as lesser media in our current publishing climate. People seem to look at short stories as stepping stones to the “real” literature of the novel. What are some of the great things that short stories can do differently than novels? Diane Walton: I know that some writers depend on their published short fiction to open doors and get them on the radar of the book publishers like Edge and Tor, and that’s not necessarily a bad thing. One author even told me that was why they sent stories to On Spec—because our writers got noticed, and it opened doors when the novel manuscript was ready to submit. Flattering, and yet kind of sad in some ways, because a talented short fiction writer will often concentrate on novels because that’s where they get noticed, and make some money. But the short story is such an elegant and challenging art form. A powerful short story can stay etched in your memory for decades after reading it. Harlan Ellison’s “Pretty Maggie Moneyeyes”, for example. Shirley Jackson’s “The Lottery” is a story that still can make me shiver. A short story needs to hit the ground running, and grab the reader’s attention without the “warm up act” that the first chapter of a novel can provide. A short story of any genre has to suspend a reader’s disbelief immediately, engage them with the character or characters, and make them WANT to know what is going to happen. Spec Can: What is different about Canadian Fantastic fiction than American Fantastic fiction? What different themes, issues, and ideas tend to surface in the North? Diane Walton: I am probably not the best person to ask this, partly because I don’t do a lot of reading for pleasure any more, and what I do read is extremely selective. I don’t pay attention to themes or issues. If anything, it is entirely possible that some influences from Canadian and British SF have made their way into the work of new American writers, as the genre becomes more and more global. One the other hand, I bet more Canadian fiction has a stronger focus on something like a harsh winter and fighting the elements. Spec Can: What are some things that readers and fans can be doing to encourage more reading of Canadian fiction and to support our own literary community? Diane Walton: There is lots of information available online these days, and it’s ridiculously simple to Google phrases like “Canadian science fiction writer” and “Canadian science fiction magazine”. In fact I just did that, and the first thing was a Wikipedia list of Canadian SF writers, followed by a listing for Robert J Sawyer, and then followed by SF Canada, the professional organization that I’ve recently been elected Secretary-Treasurer of. Then the Aurora Awards are mentioned. Then the Sunburst Award. All very good sources of great books and authors a Canadian fan should get to know. Spec Can: What would you like to see more of in Canadian SF fiction? Diane Walton: I’d like to see less snobbery from the gatekeepers of the literary “establishment”, and then maybe top-notch authors like Guy Gavriel Kay would be on the short lists for mainstream prizes like the Giller and the GG where they deserve to be. Spec Can: To finish our interview, what can readers do to find out more about your own work and about OnSpec magazine? Diane Walton: Well, we do make a free sample available to download from our website www.onspec.ca , and the magazine is also ridiculously simple to buy in digital format from Weightless Books. https://weightlessbooks.com/format/on-spec-magazine-1-year-subscription-4-issues/ And of course we sell print subscriptions. We’d like to think that once a reader has seen what we have to offer, they’ll be happy to keep us in the business of providing good reading for a while longer. We depend on word of mouth because our funding doesn’t give us enough to advertise, and so every new subscriber is gold for us. And while I have your readers’ attention, might I add that we are looking for sponsors and new sources of funding, so donations are always welcome. I want to thank Diane Walton for all of her insights and for taking the time to talk a little bit about Canadian short fiction and the nature of running a speculative magazine. This Wednesday July 16th I will be doing an interview with Diane Walton, managing editor of OnSpec magazine: speculative author, feminist, fan, and supporter of the Canadian fantastic. Ms. Walton and I discuss the nature of the Canadian fantastic, pushing the envelope in SF, bringing forward characters from diverse backgrounds that are often under-represented in texts, the challenge of creating an SF magazine in a cultural climate the views SF as non-literary, and the power of short fiction. So, this Wednesday, check out my interview with Diane Walton and share in her insights. A review of OnSpec #90, Vol 24, No. 3 Fall 2012 Apocalypse Special Issue. On Spec, with their combination of SF stories and non-fiction SF essays and interviews, never fails to be entertaining, but the special issue on the apocalypse was even more fantastic than most. It was as thought-provoking as it was entertaining, reminding readers of their own culpability in creating the potential for a destroyed world as well as their responsibility for making the world a better place. The layout of the volume was, itself, fascinating and had the ability to draw the reader in on multiple levels. This was most in evidence by the interweaving of Kevin Cockle’s “Timeline” (a recounting of some of the history of economic theory as well as a postulation on the future of economic policy and where this will lead) throughout various narratives – every few pages, elements of Cockle’s timeline would appear at the bottom of the page, threading itself through the overall narrative of the On Spec volume and tying stories together. As a disability scholar who does work in fantastic fiction, I was particularly taken with Camille Alexa’s story “All Them Pretty Babies”, which challenged social ideas of beauty in the post-apocalyptic future. Unlike many authors who revel in the horror of the different body, who present the “deformed” body as something that should evoke shock and disgust, Camille Alexa puts the reader into the position of her narrator, Esme, who collects babies that have been mutated by bio weapons that have damaged the future. Esme is an incredible character, able to see the beauty of diversity, seeing disability and difference as markers of beautiful bodies. She defines beauty as difference from the mundane normalcy of the human body that is preferred by most of society – Esme sees beauty in extra eyes, legs, arms, and conjoined bodies. She is dismayed that she is so boring, with only two legs, two arms, and two eyes: “Bonita’s so pretty, she probably never walk. Not even walk like New Mama, who hunch over cane and hobble like on third leg – though she’s not that pretty, what with her having only two like most” (6). Despite the human race suffering because there are too few human beings remaining after the bombing, the people of the future preserved cities are abandoning children that they view as deformed, trying to stick to an ideal of what the “normal” human being should be. People in haz mat suits come out to the destroyed fields to leave babies to die because of their biological difference, while worrying about the future of human fertility. Esme and her group go through the fields to rescue these abandoned children of a humanity that fears biological difference, telling these children how beautiful they are for their diversity from bodily norms. Esme and her group of abandoned children are trying to make the world outside of the city livable again while the city-dwellers consistently deny the changes that they have wrought. The city dwellers waste human life because the life forms they encounter don’t conform to their notions of beauty. Camille Alexa provides a commentary on the ableist (able-bodied centred) world that we currently live in. She creates an exaggerated ableist future to point to issues regarding biological diversity and disability in our current world. Disabilities are made more prevalent and occurring more often, and people with disabilities face even more discrimination – having their lives and rights taken away completely rather than facing the likelihood of facing a life of reduced rights, government control, and the medicalised body. Her future population tries to euthanize functioning human bodies because they differ from a socially determined norm and they justify these actions as humanitarian because they cannot imagine people living with diverse bodies. Rather than shifting their own notions of what is bodily acceptable, they eliminate difference and further regulate and control the body. Ideas of the danger of birth continue into Daniel LeMoal’s short story “Destroyer”, where small elements of future populations have developed the ability to project dreams into the minds of others. When a child begins to show an increased ability to control the minds around him, he is seen as a biological threat. Like Camille Alexa’s story, this apocalyptic narrative focusses on the danger embodied in the future – represented by children. Apocalyptic narratives are fundamentally about the future, and, therefore tales about children and the potential embodied in future generations brings attention to the impact we have on the future of the world. Karl Johanson’s “Frats and Cheers” is probably the most terrifying narrative in this volume for me since it shows a future population that is so inundated with media manipulation that it has lost the ability to think for itself. His population is terrifying because it shows a magnification of the modern disinterest in challenging and questioning messages. His future population enjoys reality T.V. more than the actual reality of the world around them, and actively avoids interest in world affairs, while being content to have their messages fed to them. This is a narrative of the dangers of apocalyptic stupidity – truly terrifying. Timothy Gerwing plays with ideas of religious apocalypse narratives and portrays a future that is visited by an avenging angel in his “Hog-Killing Weather”. Gerwing turns religious apocalyptic narratives on their end by creating an angel who punishes religious zealots as much as any others who show a fundamental inhumanity. Al Onia, also playing with religious narratives of the apocalypse, presents us with four horsemen who are gathered together to fight the four horsemen of the apocalypse in “Knights Exemplar”. Despite their desire to save the world around them, they are subject to the social fear and hatred of outsiders that becomes magnified in times of crisis. Douglas Smith’s “The Walker of the Shifting Borderland” creates a different kind of religious narrative of the apocalypse when he presents the embodiment of Chaos and Order and their child, the Walker, who is seeking balance between these forces. Reality is crumbling as Order and Chaos seek to maintain their old status quo and prevent new changes in the world. This is a tale of epic love when a mortal gets caught between a battle of the gods. Smith reminds us that we have the potential to change the world around us and that self-sacrifice can be a means of making the world around us better. Leslie Brown’s “Mesa at the Edge of the World” portrays a future in which the government has provided a method of euthanasia for any who want to commit suicide. Rather than putting funding into health care and psychological care programmes, the government has shown a willingness to ship people who seek suicide out into the desert so that they can hurl themselves into a vortex. Brown illustrates the treatment of people with psychological disabilities as disposable objects and inconveniences. The apocalyptic narratives in this On Spec issue are not ones of futility, hopelessness, or loss, but are rather reminders of the importance of continuing a battle for social justice and a reminder that we have the potential to change the world around us, to fight the apocalypses that we continually create around us. You can explore On Spec at their website at http://www.onspec.ca/ and pick up a copy of this apocalyptic issue since the world didn’t end after all. Thank goodness you will have enough time to read this before the next apocalypse comes along. I have been a fan of On Spec for some time. I enjoy the quality of their stories, the diversity of their authors, and their ability to play with diverse characteristics of the speculative medium. I enjoy the fact that On Spec combines short stories with poetry, essays that provide insights into the nature of speculative fiction and trends in the speculative genres, interviews with authors that provide insights into the authorial process and the thought that goes into a creative work, and I am impressed by On Spec’s willingness to bring in artistic works that play with ideas of the speculative rather than focussing on the textual. Perhaps one of the reasons I enjoy On Spec so much is that its ideologies match so well with my own. Like this website, On Spec is interested in both exploring speculative authorship at the same time as it is aware of the incredible insights an author can provide and the complex issues that speculative fiction authors bring into their works to evoke thought from their readers. As a speculative artist (you can check out my art work at www.dereknewmanstille.ca ), I particularly enjoy that they are willing to engage in multiple media of the speculative, not just sticking to short stories, but displaying an interest in works of photography, painting, pencil and ink sketches. It is great to see a recognition of the diversity of media that people operating in the speculative can bring out. On Spec also displays an interest in quotations, and an incredible aptitude for pulling out the most poignant and thought-provoking quotes in a story. I always find it exciting when I look at the quotes that they have pulled out of a story and notice that they match the ones that had drawn me in. Normally I like to review a selection of short stories from On Spec volumes, but I thought I would do a quick overview of the Summer 2012 issue to look for binding themes and ideas that pull the volume together. This volume taps into an interest I have noticed recently in the theme of displacement by Canadian speculative fiction authors. There is a sense of loss that permeates this volume, a sense of homes forgotten, the search for a new place, the feeling of being left behind by people, by time, and by places that shift and change in such a way that we can no longer fit into them. Memories fade and we are lost in a place between them. There is an edgy sense that knowledge and wisdom can be alienating and that, perhaps… sometimes ignorance, while not very fulfilling, can at least keep one from the horrors of knowing about the loss of everything that can be valued. The volume begins with an essay on Steampunk, a genre or aesthetic that plays with notions of the displacement of time and uses elements of past worlds and the notion of nostalgia to create a place of adventure outside of the normal course of time. In the words of Mike Perschon, Steampunk “is the way the present imagines the past seeking the future.” It is a complex interweaving of times and notions of time that both plays with notions of nostalgia for the past, while also complicating notions of the past and the way we see the past from our present perspective. That sense of the defamiliarisation of time itself carries over into the first story, 7:54 by Susan Forest, a story about the ability to see into the future, and the inevitability of the future that opens moral questions about the way we envision ourselves moving forward. Shen Braun’s Village of Good Fortune is set in the past in the world of Japanese shintoism where spirits and demons are part of the landscape of the world. Here, the displacement shifts to a man who has had to leave his home and searches for a new place to call home, a place of belonging and comfort. But, these things are not easy to find and even the most pleasant village can have a dark undercurrent running through it, a shaky ground of ambiguity between ideas of right and wrong. This place of metaphysical and moral ambiguity brings us to another story about questions of morality and the nature of good and evil, Peter Darbyshire’s The Only Innocent Soul in Hell. The terrifying thing about hell in this story is that it shows a remarkable similarity to the bureaucracies of our everyday experience…. and this reminds us that although we believe we are living in a world of familiarity and normalcy, there really is hell lurking in every government building. Darbyshire portrays the typical impatient, self-righteous customer as the archetype for the sociopathic personality, and, reminds the reader that people who play the system too well… a pretty hellish system at that… are probably devils in sheep’s clothing… or at least expensive wool suits. Through hiding his memories… and a few other tricks, a sociopath tries to trick a demon into letting him out of hell. 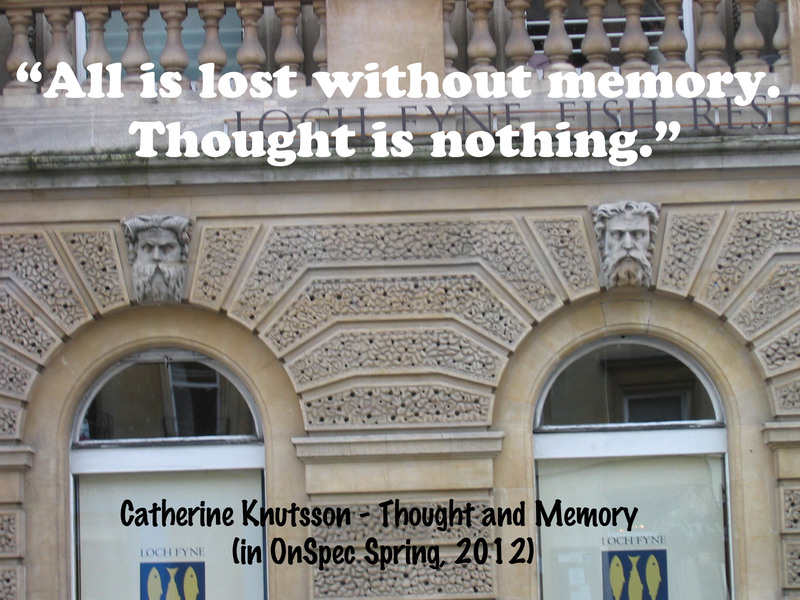 The theme of memory and the loss of memory follows into E.J. Bergmann’s Penultimate, a poem about the process of aging and the loss of memory and selfhood that can be seen to arise from the experience of getting older. It is a crushing poem about the systematic loss of the self, a story being unwritten with pages torn out of the autobiography of the self. Paul Kenneback’s In Which Demetri Returns the Elgin Marbles takes the notion of loss to an international level and shows the horror of a world that has decided to forget its own history, emptying museums to fill them with the less controversial and less diverse Disney. It represents the ultimate Disneyfication and Touristism of the world: turning the world into a spectator’s gaze reflecting itself – everywhere cultural specificity is erased so that every nation is just a mirror of the United States with slightly different climates. Kenneback shows the horror of a world that has been systematically erased in the name of social control and propaganda, a place that has been neutralised and whose art has been rendered bland and undifferentiated. Kenneback wields his narrative of an artist working for museums trying to promote Disney in order to evoke in his audience a desire to question the focus on the modern and the systemic loss of cultural memory and artistic past that defines civilisations. Canine Court by Tyler Keevil, takes away the notion of familiarity in one’s family. He portrays a typical Canadian small town with a secret and a displaced city boy who soon discovers that things may not be as they appear in the town or in his own family. Keevil’s tale features werewolves, but the kind of predators that lurk in small towns may not all have fangs. Kevin Shaw’s Bespoke explores the lack of familiarity that can be evoked by a changing body, a body that has been mutated into a shape that is responded to by onlookers with horror. But, although often body changes are portrayed in stories as tales of the loss of the self, an inability or lack, in Shaw’s narrative, this body change can distance someone enough from their familiar patterns that they can be encouraged to develop new behaviours, new relationships and when slight changes are made to accommodate their bodily difference, a new respect and love for their changed body. This volume of On Spec was an amazing adventure into the unfamiliar territories that lurk hidden in the shadows of the familiar. The reader finds him or herself lost, disassembled, made strange to her or himself and then brought back together with a new understanding of the world around them and appreciation for the weird places that lurk between the cracks of the normal. Review of “Long Leap” by Derek Kunsken. In On Spec Vol. 24, No. 1, Spring 2012. Derek Kunsken takes on a huge challenge by portraying a character who is utterly without emotions, a sociopathic (though not officially a sociopath) character who is distanced from the human and who murders. He portrays the ultimate monster – the one that can hide in our society and pass as human. Robert IS officially human, but he is so dissociated from the human experience, he should be unrelateable. However, Kunsken creates his character as a futuristic Dexter, a sociopath that is portrayed as somehow possible for the audience to understand if not entirely relate to. The skill of Kunsken’s craft can be seen in his ability to make Robert understandable to the reader. Despite the offputting, offsetting nature of the sociopath, Kunsken is somehow able to get into his mind and make him human for his audience. Kunsten sets his sociopath on a small, restricted society – a space ship adrift in the cosmos on its way to a colony world. This society, knowing that it is going to be in transit for years beyond their own lives have decided to almost entirely give up the sciences and become a colony of artists. He suggests that if given a society in which their physical needs are accommodated, almost everyone would opt to become an artist. Artists are figured in our society as creatures that live in perpetual emotion, and Kunsten reinforces this by having only a handful of people interested in anything other than the arts. Of the few scientists is the only sociopath, cut off from emotional understanding and the humanistic touch that guides the arts. Despite travelling through space, the only one interested in looking up at the sky and becoming an astronomer… is someone who cannot understand humanity. This colony of artists are pulled off course and end up having to rapidly learn the sciences when dropped into a binary star system where the only planet is made entirely of toxic metals. The sociopath in the village, dissociated from humanity, is the only one who is able to understand a wider interpretation of life and make calculated risks. You can explore On Spec’s website at www.onspec.ca. Regan Wolfrom’s The Hill Where Thorvald Slew Ten Skraelings recreates a Norse worlds where Seidr, magic, meets Viking might and ideas of strength. Wolfrom challenges ideas of masculinity in this short story, using a group of people, the Norse, who are often associated with the extremes of masculinity and male violence, to complicate notions of heroism and the masculine. Wolfrom creates two protagonists: Sveinn, a young Norse man at the height of his strength, and his uncle Thialfarr, a Seidrman, magician, whose body becomes weak with the more seidr he performs. His strength, his power of magic is antagonistically linked to his physical strength and health. His social purposes are collective, sacrificing himself for the greater good of his people. Sveinn, much like our modern conception of the Norse, is heavily individualistic, assertive, aggressive, and fundamentally threatened by idea that don’t fit into his world view. He sees Thialfarr as fundamentally feminine and threatening, but possessing a power that he desires to claim for himself. Sveinn fears that cooking and other ideas associated with the feminine will bring shame upon him, while Thialfarr tries to teach him to shift his ideas to a broader understanding of collective power and the need to protect his people and care for them. Christian and pagan are set side by side in this Norse world where magic and masculinity are put in opposition to one another to open questions about what the idea of ‘power’ means. Wolfrom also questions ideas of the monstrous and situates the Skraelings, an enemy of Norse people as not monstrous, but, rather, a different group of human beings with similar life challenges and experiences. Re-situating the Skraelings questions the idea of ‘otherness’ and suggests the need to explore cooperative practices and understandings rather than violent opposition. Worlfrom privileges the notion of understanding other people over constructing others as monsters. Wolfrom reminds us that words and thoughts really do hurt, and, in the world of magic, can literally change the surrounding environment and patterns of fate. This story is well researched and insightful, posing a different conception of the Norse while challenging ideas of individualist, violent masculinity.